The September/October issue of Vineyard and Winery Management Magazine has an article I wrote on Washington's new Wine Science Center. You can read the article here (Note: Opens .pdf). 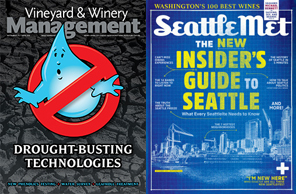 Additionally, as previously noted, the September issue of Seattle Metropolitan contains this year's Top 100 Washington wines article.